Mary Teston Luis Bell (3 December 1903 – 6 February 1979) was an Australian aviator and founding leader of the Women's Air Training Corps (WATC), a volunteer organisation that provided support to the Royal Australian Air Force (RAAF) during World War II. She later helped establish the Women's Auxiliary Australian Air Force (WAAAF), the first and largest women's wartime service in the country, which grew to more than 18,000 members by 1944. Born Mary Fernandes in Tasmania, Bell married an RAAF officer in 1923 and obtained a pilot's licence in 1927. 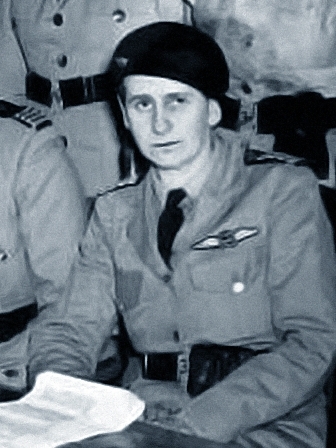 Given temporary command of the WAAAF on its formation in 1941, she was passed over as its inaugural Director in favour of corporate executive Clare Stevenson. Bell refused the post of Deputy Director and resigned, but subsequently rejoined and served until the final months of the war. She and her husband later became farmers. Nicknamed "Paddy", Mary Bell died in 1979, aged seventy-five. Born on 3 December 1903 in Launceston, Tasmania, Mary Bell was the daughter of Rowland Walker Luis Fernandes, an English-born clerk, and his Australian wife Emma Dagmar, née Mahony. She attended Church of England Girls' Grammar School, Launceston, and St Margaret's School, Devonport, before commencing work in a solicitor's office aged fourteen. She married John Bell (1889–1973), a Royal Australian Air Force (RAAF) officer and World War I veteran of Gallipoli and the Australian Flying Corps, at St Andrew's Anglican Church in Brighton, Victoria, on 19 March 1923. They had one daughter. From 1925 until early 1928, the Bells lived in Britain while John attended RAF Staff College, Andover, and served as RAAF liaison officer to the Royal Air Force (RAF). Interested in aviation since her teens, Mary learnt to fly in England and in April 1927 qualified for a Grade A private pilot's licence. Returning to Australia, she was the first female to gain a pilot's licence in Victoria, on 20 March 1928. The following year, she became the first Australian woman to qualify as a ground engineer. The Bells moved to Brisbane in 1939; John was employed as Queensland manager for Airlines of Australia Ltd, having left the RAAF in 1929. Mary became leader of forty or so members of the Women's National Emergency Legion Air Wing who had volunteered to assist with aircraft maintenance during times of war. Determining that their objectives would not be met in their existing organisation, on 17 July they formed a new paramilitary group, the Women's Air Training Corps (WATC), and elected Bell its commander. She soon expanded the WATC into a national organisation, with commandants leading each state's chapter, and herself as Australian Commandant. WATC members trained as drivers, clerks and telegraphists. Bell wrote to Air Vice-Marshal Richard Williams, with whom she was acquainted via her husband and through aviation circles, advocating the establishment of a women's branch of the RAAF similar to the RAF's Women's Auxiliary Air Force (WAAF). Among other things, she pointed out that female volunteers such as hers were already supporting the Air Force in driving, nursing and clerical duties. The WATC was one of several women's voluntary organisations whose members were keen to support the military, arguing that their personnel provided a ready-made pool of skilled staff for auxiliary services, saving the government time and money training unskilled labour. Australia having declared war on 3 September 1939, the RAAF Air Board met in November to discuss Bell's letter, but postponed taking any further action. She continued to lobby, as did several women's groups seeking to support the war effort and free male staff for overseas postings. In July 1940, the new Chief of the Air Staff, Air Chief Marshal Sir Charles Burnett, invited her to produce a proposal for a women's auxiliary, supervised by her husband John, who had rejoined the Air Force at the war's outbreak and was now a wing commander in the Directorate of Organisation at RAAF Headquarters, Melbourne. Mary recommended forming the new service under the Air Force Act to permit women to enlist for the duration of the war under conditions similar to RAAF members, rather than enrolling on a short-term contractual basis, a radical idea at the time that would not be put in place until 1943. She also suggested a volunteer reserve or citizen force to augment the enlisted women, effectively the existing WATC, though this was seen as placing too much emphasis on her personal command. Some senior Air Force officers, including the recently promoted Air Marshal Williams, and the Director of Personal Services, Group Captain Joe Hewitt, opposed a women's service. Burnett, an RAF member who appreciated how the WAAF proved its worth during the Battle of Britain, championed its establishment as the Women's Auxiliary Australian Air Force (WAAAF). Bell was appointed to the RAAF's Personnel Branch as Staff Officer (Administrative) with the probationary rank of section officer (acting flight officer) on 24 February 1941, to lay the groundwork for the new organisation. Formally established on 25 March, the WAAAF was the first uniformed women's branch of an armed service in Australia, predating similar organisations in the Army and Navy. Bell led the WAAAF for the first three months of its existence, recruiting approximately two hundred women by June; of the first six officers she appointed, five were former members of the WATC. On 21 May 1941, Berlei corporate executive Clare Stevenson was appointed Director WAAAF with Bell as her Deputy Director, effective from 9 June. The Air Member for Personnel, Air Vice Marshal Henry Wrigley, chose Stevenson on the basis of her management background and because she was not a "socialite". Notwithstanding her aviation experience and familiarity with the RAAF, he considered Bell to be "tangled up with the WATC", where she "waved the flag and obtained a great deal of publicity for herself". Bell may also have alienated Burnett by not including his daughter Sybil-Jean, a founding member of the WAAF, among the initial intake of staff. Bell chose to resign on learning of Stevenson's appointment, rather than stay on and report to someone from outside the service fraternity; she later rejoined at Wrigley's request, on the condition that she received no promotion higher than flight officer. Two of her original officer appointees also resigned when Bell was passed over, later describing her as "a thorough and effective organiser" and the "obvious choice" as Director. Returning to the WAAAF on 5 October 1942, Bell served at RAAF Headquarters in several directorates, mainly that of Medical Services. Despite Bell's recommendation in July 1940 that they be enlisted into the WAAAF as permanent staff, women were at first enrolled only for renewable twelve-month contracts; they did not become part of the Permanent Air Force, with the benefits that entailed, until 1943. Pay was only ever two-thirds that of male equivalents. The organisation nevertheless grew rapidly, peaking in strength at over 18,600 members in October 1944, or twelve per cent of all RAAF personnel. By the end of the war a total of 27,000 women had served in the WAAAF, at one stage comprising over thirty-one per cent of ground staff and filling sixty-one trades, all previously occupied by men. Ranked flight officer, Mary Bell was discharged from the WAAAF at her own request on 11 April 1945. Her husband John was an acting air commodore when he left the RAAF on 15 October. The WAAAF, first and largest of Australia's wartime women's services, was disbanded on 30 September 1946. It was succeeded in 1950 by a new organisation with a separate charter to the RAAF, the Women's Royal Australian Air Force (WRAAF); members achieved a pay scale equal to the male service in 1972, and five years later were integrated with the RAAF. After leaving the military, the Bells became farmers, first in Victoria and then in Tasmania. They retired in 1968. Survived by her daughter, Mary Bell died in Ulverstone, Tasmania, on 6 February 1979. She was buried at Mersey Vale Memorial Park cemetery in Spreyton, near Devonport, beside her husband, who had died in 1973. This page is based on the Wikipedia article Mary Bell (aviator); it is used under the Creative Commons Attribution-ShareAlike 3.0 Unported License (CC-BY-SA). You may redistribute it, verbatim or modified, providing that you comply with the terms of the CC-BY-SA.